Almost every runner I know (myself included!) wants to be a better a runner. We want to run better, perform with excellence and recover faster. So how can you achieve all of this? There are a variety of protocols and at the top of the list is excellent nutrition. What we eat (and drink) has the ability to either enhance or negatively effect our running performance. Here are some practical suggestions you can implement right away into your running routine. If you hit the trail first thing in the morning there are a few strategies you can try. The first has to do with the concept of “fasted” runs (not eating anything minus some water). Gauge how you feel. For longer runs you probably want to eat something. If you do, choose something that has a healthy fat (coconut), a simple sugar (fresh berries) and a healthy carbohydrate (steel-cut oats). Depending on the distance and duration of your run you may need nothing at all, or you may need the kitchen cupboard! I make the majority of my food for during my runs (including races) as I want to ensure that my body is getting the best nutrients possible that will give me natural energy, reduce inflammation, and speed up the recovery process. A few of my favorite staples include my Summit Sandwich (organic vegan bread with almond butter, Maca Powder, Pink Himalayan Sea Salt, raw, unfiltered honey), Smashed Sweet Potatoes (organic sweet potatoes, fresh grated ginger, Pink Himalayan Sea Salt, coconut oil, cinnamon, turmeric), and made-from-scratch protein crackers. I also supplement what I make with real food options like Froodles (these organic fruit strips are amazing), Mama Chia squeezable pouches, and Bearded Brothers bars. While most runners reach for a beer post-race, I don’t advise that. Your body is in a heightened state of inflammation and drinking alcohol is like pouring gasoline on a fire. Instead, opt for healing choices like a plant-based protein drink (I like to mix Manitoba Harvest Hemp Pro70 Chocolate with clean water). Make food choices that support and nourish your running and your body. Choose organic and primarily plant-based foods. Plant-based foods (such as kale, quinoa, hemp hearts, turmeric, ginger, spinach, spirulina, oranges, berries, maca) are anti-inflammatory and will boost your body’s response to manage pain naturally and keep inflammation at bay. You also want to incorporate healthy fats into your overall nutrition lifestyle as well. Coconut oil, raw nuts and seeds, hemp, and avocado are excellent sources of good fat. Make sure to replenish your healthy fat intake after a race as well. Since our brain is around 60% fat it is imperative that we are kind to our brains by giving it healthy fats! If you implement the above suggestions into your lifestyle, you too will reap the benefits and will be empowered to run better, perform with excellence, and recover faster. 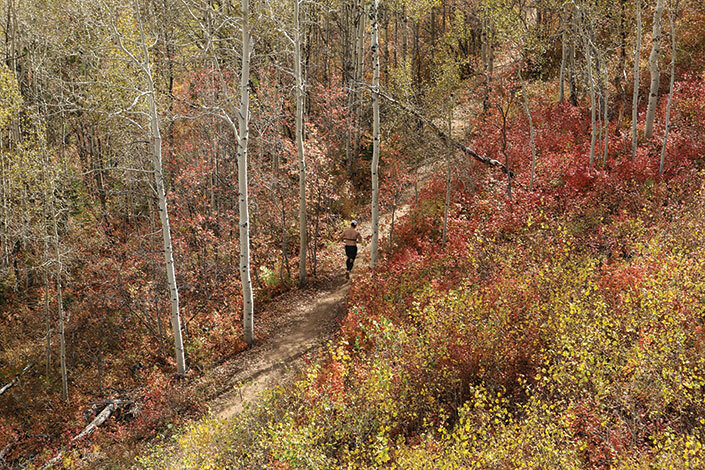 Outdoor Sports Guide is teaming up with The North Face to give away a FREE entry to the distance of your choice to the North Face Endurance Challenge in Park City September 24-25. Visit sportsguidemag.com before August 20, 2016 to enter. The winner receives race entry and The North Face training kit (shoes, shirt, shorts, and running jacket).